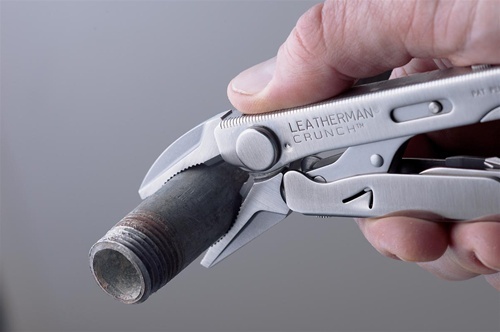 Crunch is a new kind of Leatherman made for the most demanding professional or do-it-yourselfer. It is the only folding tool on the market that offers locking pliers. All interior blades lock as well. Each opens individually, locks positively in place, and is unlocked by a push-button mechanism. Crunch is full of surprises, like jaws that open to clamp on 1" diameter pipe and a 1/4" hex bit adapter built right into the end of one handle. 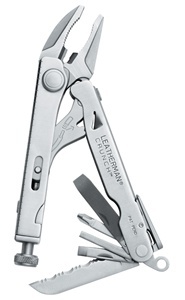 And it all comes in a six-ounce tool that folds down to the same length as Leatherman's original PST.